DUBLIN – The presidential debate began long after our bedtime, here in Ireland. So we got up this morning, rubbed our eyes, and watched the highlights. “Lowlights” is perhaps a better way to describe it: two rascals making public spectacles of themselves, arguing about things that mostly don’t matter… posing, posturing, pretending. If we had our druthers, both candidates would lose. That is unlikely. So, the show goes on. The press reports that Hillary “won.” We’re not so sure. She seemed calm. Sensible. Composed. She’s a master of the “facts.” She’s smart. She also knows how the game is played; she’s lived at public expense almost all her life and intends to continue to do so. Trouble is, a substantial segment of the adult population is fed up with the game she’s playing. They’re the “invisible Americans” who have been swindled by the system… sent to fight fake wars they were never meant to win… the people whose jobs were shipped abroad… whose savings were robbed of their interest income by the Fed’s phony rates… and whose children’s futures have been impoverished by the fake economy. They’d rather vote for an orangutan than for Hillary. The simians had too much self-respect to enter politics, so the Republicans ended up with Donald Trump. Poor Donald. He has some good ideas, some bad ideas, and some ugly ideas. If he only had half President Reagan’s dignity, he’d surely be our next president. And while the public watches the clowns in the coliseum, the empire wobbles. Yesterday, shares in “too-big-to-fail” German bank Deutsche Bank fell another 7%. Its share price has been cut in half over the last year, as investors wonder whether it will survive. The share price of DB is by now down more than 90% from its 2007 peak, and the bank’s market cap barely exceeds the most recent fine US regulators want to shake loose from it. It also happens to be the bank with the world’s biggest derivatives book. It’s scary. The largest pile of derivatives in the world. And the bank is already leveraged more than 25 to 1. That means if asset values decline 4%, the equity is wiped out… along with over 2,000 unsecured bonds. It was an Austrian bank failure that set off the crash of 1929 and the Great Depression. 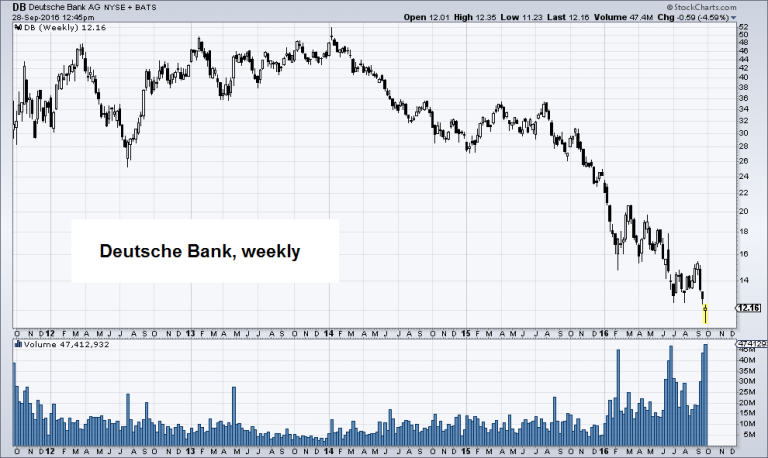 Deutsche Bank is bigger than Lehman. Its book of derivatives is 20 times German GDP. Another crisis is coming. We can be sure of it. 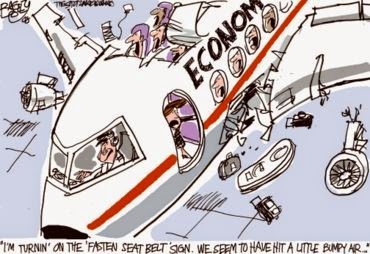 Because the problem behind the crisis of 2008 – fake money, fake interest rates, fake economy – was not corrected. Instead, the Feds made it worse. Excess debt in the mortgage sector moved to the corporate sector – especially in emerging markets. It’s been 10 years since we published our book Empire of Debt: The Rise of an Epic Financial Crisis. We didn’t fully understand money at the time. And a lot has happened since. But we were right about one thing: the role of debt. Most empires were financed by theft. As far as we know, the U.S. is the first to run an empire on fraud. The usual business plan involves conquering other nations, stealing their wealth, and demanding tribute for protecting them. Instead, the U.S. pays for its empire with fake money. Now, Hillary Clinton and her backers – especially those on Wall Street and inside the Beltway – but practically the entire world economy, too – depend on that phony financing. Emerging market corporate debt securities outstanding (overall) – up three times between 2009 an 2015. Even more has been added to the pile since then – click to enlarge. In the 1980s, Japan Inc. showed the world how to get rich: Take advantage of America’s Empire of Debt. You sell products to the people whose jobs you have taken away. The rest of the emerging economies got the message – “export-led” growth was the way to go. The United Nations has a group called UNCTAD, focused on trade and development. The UN is, of course, a cornerstone of the international Deep State. It is meant to uphold the values of the global elite – business schools, NGOs, financialization, managed economies, controlled capitalism, and various claptrap campaigns to set up windmills and promote transgender rights, among others. We know already that a poisonous side effect of zero interest rates and QE in the U.S., Europe, and Japan was to flood developing nations with cheap credit, upsetting their internal chemistry and drawing them into a snare. What is less understood is just how destructive this has been. Worse still, these countries have imported the deformities of Western finance before they are ready to cope with the consequences. This has undermined what UNCTAD calls the “profit-investment nexus” that ultimately drives growth and prosperity. The post-1971 dollar allowed Americans to buy on credit as they had never been able to do before. The new dollar was no longer tied to gold. 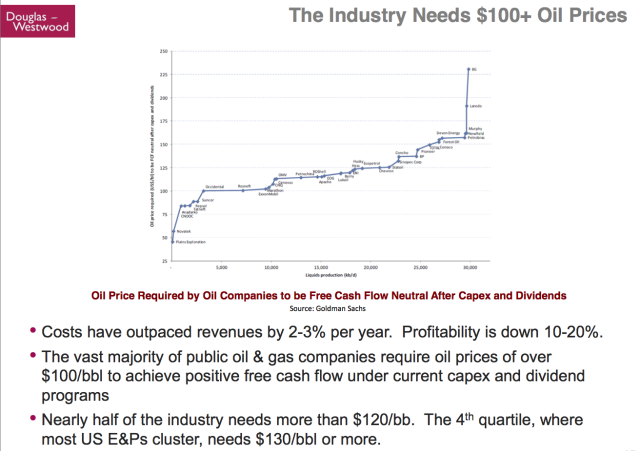 So, dollar credit could be almost infinitely increased. And so could the output capacity of “export-led” economies. 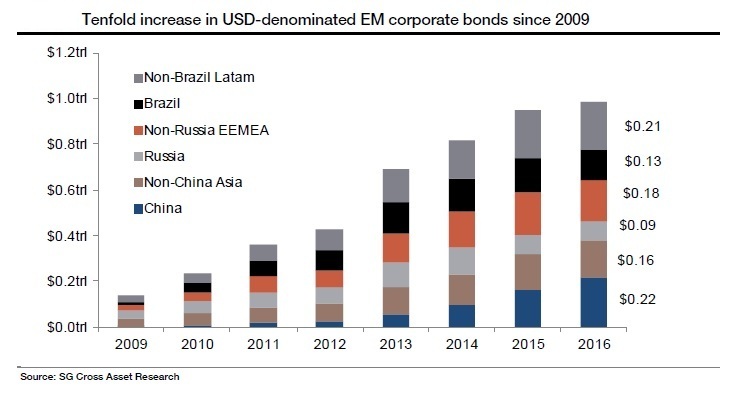 The USD-denominated portion of EM corporate bonds has even increased 10-fold since 2009. The problem is that most of their domestic currencies are worth a lot less since then – click to enlarge. This has led to too much debt and too much capacity. 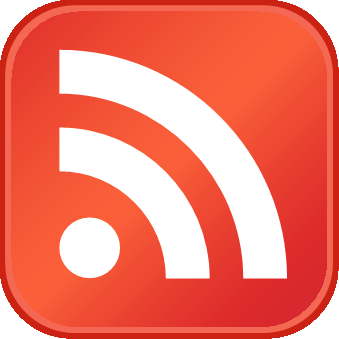 It has also caused one boom and bubble after another – in Japanese stocks and real estate in 1989, in Asian and then Russian debt in 1997 and 1998, in dot-com stocks in 2000, and in sub-prime mortgage debt in 2008. 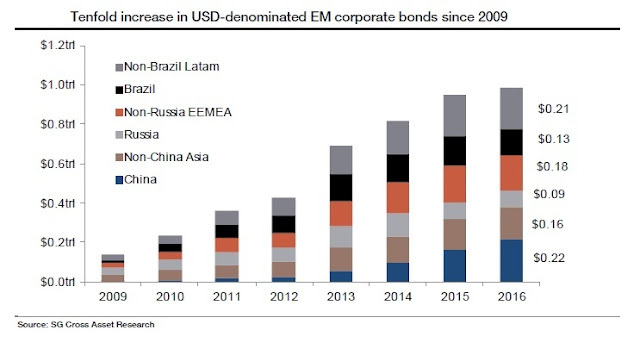 And now it looks as though emerging market debt could be next. 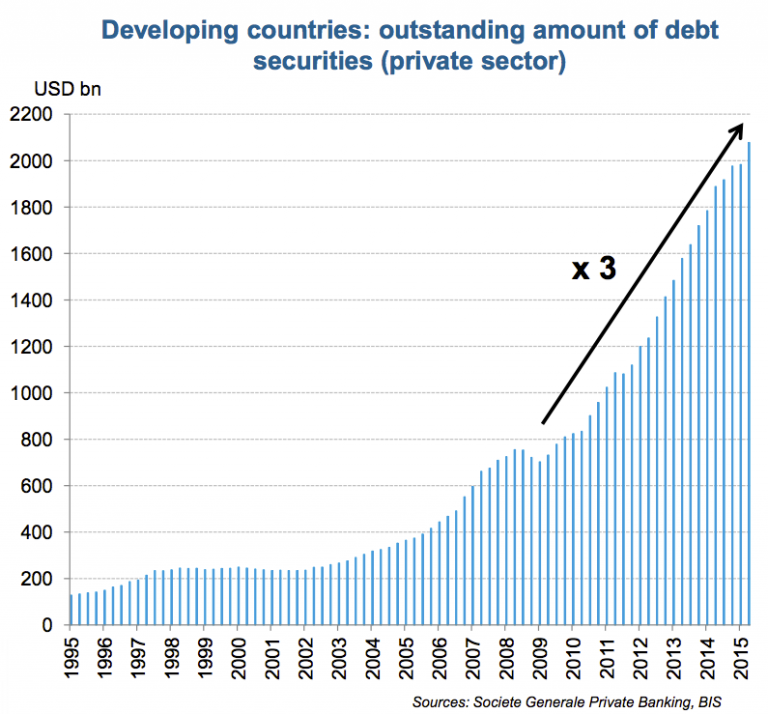 Banks own much of that debt and of the derivatives connected to it. And as Chris Mayer mentioned above, it doesn’t take much of a drop in value in this paper pile to put Europe’s biggest bank, Deutsche Bank, out of business. That could drag down the rest of the banking system, the financial industry, the markets, and the world’s economies, too.